A recent survey conducted by the Ministry of Manpower (MOM) this year reported that the increase in the number of freelance workers could be attributed to the emergence of the sharing-economy platforms or gig economy platforms. Grab, Uber, Deliveroo are examples of such modern economy platforms. The survey served to highlight the concerns of the MOM for these freelancers. One such concern was their “retirement adequacy” and the lack of “financial planning” on their part. I, on the other hand, advise freelancers to seriously start protecting their business and their sources of income as an urgent priority. Only with a consistent flow of income can a freelancer then consider any financial planning for his retirement. How can the freelancer ensure a consistent flow of his income? By protecting his business, of course. Before we delve into the intricacies of a freelance contract, we shall need to be certain of the meaning of “freelance”. Its meaning determines the type of contract to be discussed here and the relevant terms. Minister for Manpower, Mr Lim Swee Say, referred to “freelance workers” as “persons who operate their own business or trade. This means that they are their own employers. They decide which service contracts to enter into. There is no employer-employee relationship between them and their clients”. We therefore conclude that a “freelance agreement” is akin to or similar to a “contract for services”; referred by the Ministry of Manpower, Singapore as one in which “an independent contractor, such as a self-employed person or vendor, is engaged for a fee to carry out an assignment or project”. In spite of the burgeoning number of primary freelancers in the work economy, there is still no dedicated statutory protection for them. Minister Lim noted that they did not fall under laws regulating industrial relations between employers and employees – specifically, the Employment Act, the Trade Unions Act, the Industrial Relations Act and the Trade Disputes Act. So how should freelancers protect themselves? Having an effective contractual agreement is one way! Having a contract that addresses the salient aspects of the relationship between the freelancer as a service provider and the principal is crucial. The freelance worker should ensure that main concerns that will affect him and his business are addressed in the contract. These areas could be medical benefits or provisions, insurance, commission or income and even fringe benefits such as share options. 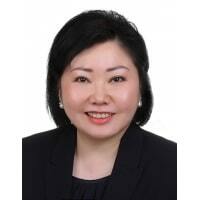 The second method to seek protection is to be familiar with various forms of recourse available in Singapore. An example of one such avenue of recourse is the Small Claims Tribunal (SCT) that is discussed below. The freelancer may wish to be certain if he is able to reject any assignment that arises out of the relationship. One example is the sharing economy platform. Can the freelancer reject an assignment for a delivery-service or a transport-service? Once in a while, we do come across news in Stomp of Grab or Uber drivers rejecting certain passengers. Are these drivers then considered being in breach of their contracts with their respective principals? You need to be sure if there are such terms in your contract. Is there any exclusivity imposed on the freelancer to restrict the freelancer from working with the competitors of the principal, for instance? The freelancer should want to be aware that such terms limit his freedom to enter into other contracts with other principals; thus, his other sources of income. 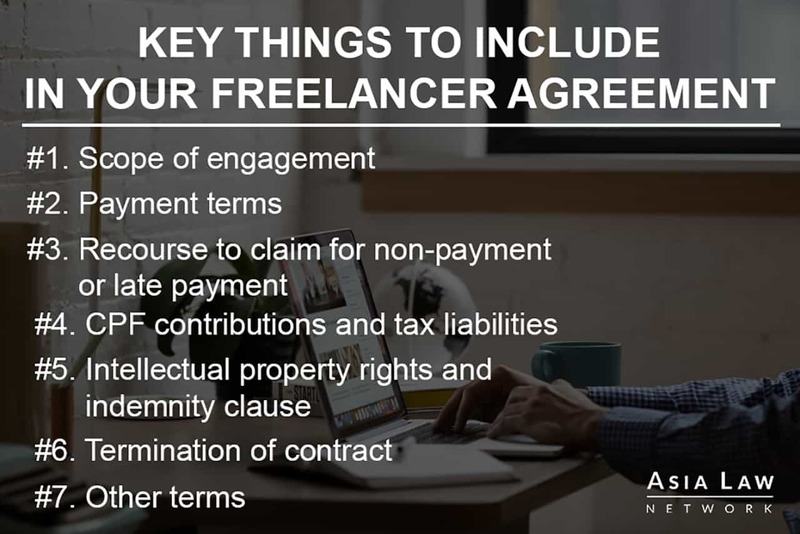 As a freelancer, you need to specify clearly your payment terms to ensure that your income flow is consistent and that there are no bad debts to chase. The time spent to chase for payments is the time that could be used to generate income. Terms that you will want to be stated clearly in your contract could be, firstly, rates. Make sure you specify your method of charge to avoid any dispute. You could be charging an agreed and fixed amount or your charges could be based on manhours or work-scope. If you are expending costs as you embark on an assignment, you would want a deposit to tie you over the initial period. For instance, you may have to purchase materials in order to start a project, you would then have to incur some initial overheads before your invoice is finally settled by your customer. The deposit could be non-refundable and be used to off-set the invoice-amount. It is important to set down your conditions in regard to the deposit to stave off any potential loss should the client renege on the contract or change his mind about completing it with you. If the nature of your work entails service levels or work to be done in stages, then you will need to consider progress-payments to be made by your customer. Progress payments are a good way to ensure that you receive payment throughout the work process, as you perform your services or deliver your product. Lastly, your customer may want to insert terms such as the contractual right of set-off. You may not want to agree to such terms so easily so as to minimise opportunities for your customer to arbitrarily withhold or refuse to pay an agreed amount or part thereof- alleging that you did not meet certain standards or did not perform certain aspects of the services. This affects your income-forecast. The usual period for payment terms could be immediate or a number of days or months; depending on the nature of your business and your risk-appetite. In any case, you should want to state clearly the payment terms in the contract. If you want to charge interest for any late -payment, you would want to not only ensure that you specify the rate of interest but also to ensure that the interest charged is not exorbitant. Otherwise, it could be deemed a penalty in which case, it may not be upheld in a court of law. You may also wish to insert a clause in your contract which allows you to file a claim with the Small Claims Tribunal (SCT) immediately should your first or second reminder of a late payment be ignored. Such terms may reduce the risk of an overtly late payment. For claims in an amount less than S$10,000, you are able to file a claim for payment with the SCT which hears claims based on the sale of goods or provision of services. As a freelancer or a self-employed person, you are responsible for paying your CPF contribution and income tax. Nevertheless, you should still want to ensure that any reimbursement to be made by the customer to you is clearly stated in the contract as being conditional upon presentation of a receipt; that is, such reimbursements are not in any fixed amount lest such fixed-amount payments (even for transport) attracts a tax-liability. To a principal, such as Uber or Deliveroo, intellectual property rights (IPR) are a huge asset. They definitely would not want their IPR such as their mark to be tainted, for instance, being used alongside that of a competitor. A good example could be if the freelancer is both a Grab and an Uber driver and he uses both logos alongside each other on his vehicle. You need to take note of such IPR terms and keep in mind to be compliant as you may open yourself to liabilities that can cost you. On the other hand, if you produce works such as writing or any work of art as a freelancer, you need to insert terms in your contract to protect your business. The need to do so is apparent when your customer asks to have sight of your initial drafts. Imagine the situation where a customer decides to switch service-providers and terminate your assignment halfway-after taking a look at your draft. Your customer then goes to another service-provider whom he feels can give him a better deal coming up with that same design or work of art. Your customer then shows him your draft in order to get a quote from this other service-provider. Nonetheless, you need to recognise the commonly accepted position that once a customer or employer pays for the work to be finished, the IPR of that piece of work, e.g. the copyright, usually belongs to the customer. Examples of such scenarios could be a customer getting a website done up, a customer wanting to do a write-up for a marketing brochure or a customer outsourcing the design of his product. You may not feel it is appropriate to discuss this with a customer at the onset when everything is hunky dory. However, it is always best for a business-person to hedge against Murphy’s Law. So do insert terms for termination. Termination can take place when you successfully complete an assignment and receive full payment for your services or product. Termination can also occur when one party is in breach of a contract or is caught having misrepresented himself or his services or product. In the latter scenarios, termination can result in a significant loss to a party in a contract. Therefore, you should want to consider limiting your liabilities in such situations. You may want to insert a limitation of your liability up to the value of the contract for instance. Conversely, you need to ensure you will get paid even if your customer terminates prematurely. You should insert a term assuring that you will still receive payment if the termination is not due to your act of default or omission. Managing a risk that has materialised is always bad news for a small business-owner. So, keep in mind that you will also need to factor in terms such as disclaimers or waivers of liabilities; especially when an occurrence is not attributed to you. Another sensible way to manage business risks is to consider buying the appropriate insurance policy. I once had a client who provided specialist cleaning services. He caused a minor damage to a seemingly expensive work of art at his customer’s premises. The costs of the damage assessed was not small albeit the physical damage seemed insignificant. Fortunately, he was covered by his insurance policy and suffered little loss save for the small excess-amount that he bore. If insurance is typically required in your line of work, you should negotiate a term with your principal or customer to try to have the latter party bear part, if not whole, of the costs of your insurance. Just ask because if you don’t ask, you will not get. Bigger companies who are principals may have share-option schemes that they may want to consider offering to a major sector of their workforce; the freelancers. Do ask or suggest to your principal that these be added to the contract as a form of fringe benefits. Referral fees can also be a strong pull factor when choosing a principal to work with. Check how this can be triggered and the criteria you have to fulfill in order to earn such fees. Commission payments are also another form of compensation that can make your self-employment a truly rewarding one. Check on the payment schemes, payment method and times such commission-payments are made. Ensure that commission earned during your contract period is paid even if your contract terminates. I hope you will start taking note of the above 7 markers that can help you chart your course as a freelancer. They will help build a sturdy foundation for your business and ensure you will go a long way. Working freelance may be daunting, but there is help! If you need networking opportunities and additional resources, the National Trades Union Congress (NTUC)’s unit for Freelancers and Self-Employed is available to help. Have a question on how to draft a good freelancer contract? If you have a legal question about your options when you want to draft a freelancer contract for yourself, or if you have any questions about your legal rights as a freelancer, you can get a quick consult with Elaine or other lawyers. With Quick Consult, you can check out in minutes and for a transparent, flat fee of S$49, the lawyers will call you back on the phone within 1-2 days to answer your questions and give you legal advice. This article is written by Elaine Phang from Avodah Advocates LLC and edited by Tang Chee Seng of Asia Law Network.